“It’s not what you are born with that matters; it’s your mindset that matters”! During the month I spent at home recovering from surgery, I’ve had a chance to devote to my favourite pastime, that is to say, reading. Therefore, I’d like to start the last month of our academic year together, dealing with a thought-provoking book that has somehow inspired me and that I believe may help you improve your school life, your sports career but also, for the senior students, your future university career. 1) WHAT IS THE MEANING OF MINDSET? Write down your definition & check the dictionary if you don’t know the answer. What’s the equivalent Italian word? Now, according to the author Dr. Carol S.Dweck, there are two different types of mindset, the FIXED and the GROWTH. 2) Watch video 1 and do the ex in the worksheet deciding which statement belongs to Fixed and which to Growh mindset. Now here are two visual summaries of the main feature of the two opposed mindsets in terms of SKILLS = ABILITA‘, CHALLENGES =SFIDE, EFFORT = SFORZO, FEEDBACK & SETBACKS = OSTACOLI, IMPEDIMENTI. 3) Read it carefully and write down the ones that you feel are more “you” and you identify with. Can you think of a leader or famous person you consider an example of a growth mindset? Who do you think will be mentioned in the next video? In the t hird video you will find a summary of the book Mindset: How You Can Fulfil Your Potential by Carol Dweck. 4) DO YOU IDENTIFY IN ANY OF THE GIVEN EXAMPLES? I’d like to end this post with two thought-provoking infographics to reflect upon. Keep in mind that by success, we mean the accomplishment of an aim or purpose, so you can apply it to your daily life or to a higher level of experience. Think of a person you identify as successful and define their positive indicators. Glossary: Exude: show, manifest, display openly; fly by the seat of your pants: to do something difficult without the necessary skill or experience. Hold a grudge: maintain a feeling of resentment toward someone. Transactional: relating to the conducting of business, especially buying or selling. Last but not least, should you fail in a test or any other field of your daily life, do you think it’d be worth assuming, taking on the new growing mindset? Why yes or why not? Leave a comment. 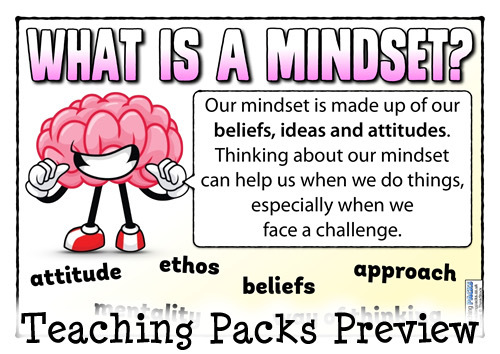 Quiz Mindset PDF Link to Carol Dweck’s Ted talk The Power of Believing that you can Improve. Worth watching. I really hope you’ve enjoyed this lesson and I’m looking forward to reading your comments. If you don’t feel like writing one, don’t do it for the sake of doing it, repeating what others have written or copying and pasting stuff. I do not have time to waste. But remember: I truly value your EFFORT 🙂 & enjoy reading meaningful & heartfelt comments. This entry was posted in Contemporary issues, Didattica web2.0 by lacimetta. Bookmark the permalink. I think it’d be worth taking on the new growing mindset. I mean, to succeed, in small and big every day’s challenges, defeats often worth more than victories. Taking for example Thomas Edison (who I chose before as a successful person), when he was trying to invent the light bulb, after numerous vain attempts, he said: “I wasn’t wrong. I found another way to not do it.” In my opinion, many would give up on the third attempt, but Edison had caught the essence of failure. Failure is not an alternative to success. Failure is a requirement of success. We have to learn to fail more often. The more we fail and the more success we get. If you are not failing enough, there can only be two explanations: either your goals are not ambitious enough, or you are not doing anything to pursue your goals. By increasing your failures intentionally, you will increase your chances of success. Any “no” you will hear repeat in the short term will be a step forward towards your goal. Try to think about: did you really hear many “no”, or are you just afraid to hear many “no”? That’s my opinion about it. If it’s true that failing more often allows you to get closer to your goals, you have to “celebrate” your failures! If you allow the defeats to fell you down, you will never have the strength to reach your goals. I really think the growth mindset should be assumed: I’m not a complete 100% human being with a growth mindset and maybe I’ll never be and no one can completely be ’cause probably everyone has a little side of themselves where they hide grudge and selfishness but life is one and is long and all we have to do is deal with it and make ourselves always better persons in it. I do agree with you Francesca, especially when you say that society looks more at the result, instead of looking at the huge efforts you make to get that result. For my entire life I have always considered myself as a honest student and a sincere girl, so I will not be ashamed to state that I felt uncomfortable and I tended to shut myself away when I read the words “taking on a new mindset”. As I am often insecure, contemplating that my precarious equibrium could be forced to change, upsetted my personality as well as the complex system of my values. Even though I was reluctant at the beginning of the lesson, by the end of the hour I was completely astonished by the influence of Dr. Carol S.Dweck’s research on me. I am well aware and very proud of my ability to embrace new opportunities, especially at school and everything which involves studying and improving my educational skills; while this comes to be a quality which defines me as a person with a growth mindset, I must admit that many of my traits indicates a fixed one. Luckily, as I previously said, during these hard months I am willing to challenge myself, possibly in a positive and constructive way. What I have learnt today is that assuming a different mindset doesn’t necessarily imply changing someone’s nature and who he/she is, so I think that in a situation of failure I would try to remember about how I felt this morning, I would read again this post, and I would put effort into having a positive attitude instead of demolishing myself! Las but not least, being aware of how much influence our attitude towards life has, will be helpful not just in hard times; “growth mindset people” use the tecniques illustrated into the research everyday, which is a habit I will try to emulate in order to be every minute a little more successful than before. Giorgia, You cannot do “anything” as we said in class but you can do GREAT things! Thanks for having been such a supportive student. What is intelligence? Our society has fourced us to think that there are level A people, who have an innate “intelligence”, and level B people which we define as the “good-for-nothing”. So we invest only in the first category. But what is not to be considered is the willpower that often overcomes the innate “intelligence”. In my opinion it’s important to believe and fight to improve the growing mind. It’s important to change our points of view because everyone is intelligent and the leatest resarch is telling us that students can reach any aims because of the incredible plasticity of the brain. So the mix between intelligence and character is the goal for true educaton and to grow people capable of living and acting in the world. The innate intelligence without ambition and continuous work is nothing. If society continues to support intelligent people without dreams and desire, it will grow a generation that is nothing. Artificial intelligence is growing up fast so the only difference between us and the computer is our attitude and this is the key to success. I would like to quote a sentence from Michael Jordan that inspires me:” Talent wins games, but teamwork and intelligence wins championships”. This means that intelligence is not the “innate” one but is created with time, with the desire to learn,to know, to create and is the result of the teamwork and the capacity to accept the failures and suggestions. In conclusion I trust in the abilities of all people and I think that the greats of history are not that such for their innate intelligence but because they believed and struggled. After reading your comments guys I can say that I’m feeling surrounded by positive, energetic people, who recognize the importance of failure, challenge and setbacks and believe that growing is not just related to age, our body or physical processes but is strongly linked to our way of thinking, to our brain, to the possibility of greater developments of what we are. I loved the way Luana describes failure in his comment and I feel so proud of her just for saying that. Realizing that what lets you down is something that gets you closer to achievement seen from another perspective, is deeply meaningful. “Failure is not an alternative to success. Failure is a requirement of success. We have to learn to fail more often. The more we fail and the more success we get.” That’s inspiring to me, it feels like we are not wasting time failure over failure but maybe our path to achievement and success is shortening. I also found truthful thoughts in the lines written by Francesca. At the end of her comment, she claimed that we can change our reality to do better after some failure but we could also try to consider what we now find boring because in a future we might see that as something interesting and the journey that leads us to that moment is even more challenging and “worth being explored” as it brings more fulfilment. I just wanted to write here what is my opinion regards some sort of little truth that seems to be unchangeable because of the way it was taught to us. When we fail in some field in life we are keen to put that aside and look for something else. When we’re not able to do some assignment for example, we instantly establish that we cannot do that and we won’t in any case get better at some point, so we give up as it much easier than trying again. But it is so wrong. It only brings more frustration, low self-esteem and resentment. Can we see things from the other way round? YES MAN!! We can always improve if we put effort and practice. The more hard it seems, the more fulfilment you’ll get. I love your way of writing, Iris! I do agree with your final sentence about the feelings caused by the failure & your thought “the more hard it seems, the more fulfilment you’ll get” is brilliant. Bik thank you, you just put a smile on my face. I appreciate this so much. “DON’T GIVE UP”: these words are very important and make me feel full of hope for my future. In my opinion it would be worth taking on the new growing mindset for different reasons. First of all, growth mindset means that with EFFORT (one of the key word for this type of mindset) we can train our brain to get smarter and thanks to the errors we make, we process them, learn from them and correct them. It happens in the school for example in a test where our mistakes are fundamental because they help us to develope our abilities and if we failed the test, it isn’t because “we are nothing”, we aren’t a number from 1 to 10, no…. we are people who need time to learn and improve ourselves, discovering and exploring new informations. Like the word says, “GROWTH MINDSET” is something that helps us to grow, also making some mistakes. I have often learned from my errors, in the school and in my life out of the school too, and it has been useful for myself. FIXED MINDSET is something that sounds a bit shallow, because people who have it, run from the error, they don’t engage with it and they believe that intelligence can’t be changed. At the end, according to the last words I wrote, we should be intelligent at the same way of 18 years ago and in 30 years we will be always at the same level.. no… I don’t think it could be possible. Mindset is our point of start where we have thoughts, dreams, opinions and it needs to develope itself without remain fixed. I love the sentence “we are not numbers from 1 to 10, but people who need time to learn and improve ourselves”, it reminds me the one that says “students are not vases to fill but torches to ignite”. I think that all people have a growth mindset and obviously there are those who try to improve it day after day in such a way to make it visible, but on the other hand, there are those who aren’t interested in being better and so they limit their mentality by becoming a fixed mindset. I see growth mindset like a gift, a potential and an aim everyone should achieve but I know that improving sometimes can be difficult. For example, I try very hard to have a growth mindset because choosing this attitude has a lot of positive aspects like: view failure as an opportunity, embrace challenges and believe that talents can be developed, but I don’t always succeed. I mean, I strongly believe that intelligence can be improved but I don’t like failures, I take them too personally instead of seeing them as chances of growing up. Another bad aspect that I need to change and to improve is that I really appreciate challenges but I not always take the opportunity to show my potential because I have fear to show my flaws and weaknesses. I know that these are negative attitudes and for this I have to improve my effort for being a better me. A person who don’t see setbacks but only opportunities, capable of transforming my weaknesses into strength. To sum up I have to say that everyone should follow the growth mindset and with constancy, commitment and effort reach the best of itself. I like your comment so much! I find myself in some of your sentences, in particular when you say that you don’t like making mistakes. I often try to not show my mistakes to the other people, but I also think that failures are something that improve a person. I grow up with the mentality that:” If you don’t work hard you will have nothing ,nobody will give you what do you want” and for this reason I’m always trying to think in different way. What really helped me to understand wich is the really meaning of “try and try again…don’t give up” is when I played basketball when I was 16,beacuse we were not an perfect team but after practice,work hard and training before going to school (250 training in one season…almost everyday) we began to be one of the most stronger and powerful team in Italy. Each sigle day we were better than the day before and worst thant the day after.That year we arrived second in the Italian Championship,we lost the final but we were proud of what we reach. In wich is consist the school ,I try to be everyday better but often the theme of what we are doing doesn’t catch my attencion, independently of the subjects, so I’m not concentrate and I don’t try. Sometime my mind is a bit “fixed mind” because it wants to stay on the “confort manner” and is bad! We are young so we must to have the “growth mindset” to reach our dream. After some time spent reflecting I have come to believe that I have a fixed mindset only in specific situations. For example nowadays my fixed mindset hit the roof because of school that seems to demand much more results in just little time. I know that the fear of not being able to go through with it won’t take me far away and is nothing but useless and destructive. But dropping a behaviour is not so easy as we could think,in my opinion if a fixed mindset person is surrounded by positive,inspiring and fighter people he could learn from them and internalize what he has just figured out. Sometimes I just stop to think why people seem to be much better than me in given situations(like school tests) and the conclusion is that or they are simply lucky or they use to work harder than me. The next step,which is the step a growth mindset person would choose,is to commit and reach the others position obteining satisfaction and personal enrichment as a result. The point is that this step is not chosen very often by the fixed mindset people because it requires an huge change and that’s why they (and so do I) keep going to reject the possibility to feel comfortable with themselves. As I said in the beginning the key could be the support of growth mindset people but it should be constant to make the discouraged one believe in its potential. All these comments make me feel confident, positive and hopeful. I think a growth mindset is the result of a numerous efforts, failures and setbacks, but in every negative experience has been always a piece of positive that helped people to do not give up. First of all a growth mindset is all about trying hard, using good strategies, and getting the help you need. In my opinion, school is the perfect field where to try and to learn. Teachers with growths mindsets are essential in a school. They can help students stay motivated to stick it out when things are difficult. In addition, they say to their students that efforts will result and remind them that they are learning when something is hard to do. Furthermore I think collaboration is an efficient way to motivated each other and grow together. People with a growth mindset are valued for their quality because they can complete a work even if it is complicated. I think growth mindsets can help fixed mindsets thinking that world is constantly changing. Let me spend few, very personal, words. I must say “thank you” for have decided to do this lesson. I really needed something to open up my mind because I felt overwhelmed by problems and my way of being too hard on myself for mistakes didn’t make me feel any better. In these last months I was unhappy of anything I did or tried to do, the only thing that came to my mind was “I can’t”. Whatever it was, I felt like it wasn’t for me, that I couldn’t achieve it, that I wasn’t able to do it. Since this lessons started I broke my “routine”, therefore I decided it was time to stop avoiding problems, situations and whatever happened to me because that’s what I’ve been doing during the last months, and I feel I shouldn’t do that. So, this topic was fundamental to let me face myself, I want to have a better approach day by day with more and more situations, I want to be better for myself, I’ll do that somehow. I’ve already found some “Fixed Mindset” in my way of thinking, what I know is that it hasn’t been like this until now. In conclusion, I hope I’ll keep in mind the verb “to improve”, I’ll use it in any moment of my life and I’ll learn to keep doing better, to remember the power of “yet” and not to waste any more of my time. That’s what I want to be, a better “me”, with a grown mindset. You’re welcome ginevra, as I have also learnt a lot myself during these sessions. I’m one of those people that think the school’s achievements don’t define how intelligent you are. I personally believe that there are students that get impressively high marks but are, at the same time, not be able to make a speech a bit more “challenging” because they have a really fixed mind. I love people who discuss about extra-ordinary things, who ask themselves questions about the strangest things and who are bothered by the thought of never knowing the truth in its entirety. But I, as the man in the fourth video, think that we can develop our intelligence, for example trough what we learn at school (that I believe is a great opportunity that we can only pick up positively, because it makes us realize about our ability or “disability”, and it allows us to have a clearer idea of what we would like to do in our future), but also trough interpersonal relationships. About that, when in the video the man talked about the relations with other people, I paused to think about it better. The man says that the most important things to do are understanding, forgiving and moving on. WHAT? I strongly believe that these are the most difficult things to do in certain situations. Thinking “how can I learn from this?” is impossible when you are blinded by anger with a friend, with our parents or with a partner. I understand that work and effort combined are the only solutions to rub along, but these things represent a problem, how can we overcame them? (I accept tips ;)). I really hope to be able to succeed in my qualities and passions to have mind that is always improving in its not being fixed. I’m sure that every mindsets is a wonderful mystery, because it is different from any other (fortunately!) and is very interesting to talk about it without hides “flaws”, because the knowledge of them is also important to lead us to improve more and more. Great comment Luna, guess it was of interest to you 😉 as you can see, motivation & interest is the key to success. When somenone is young, you can already understand if he has a fixed or a growth mindset. Obviously because his behaviour, his way of acting faced with the problems, the difficulties that he encounters during his life, his way to react and think. But it’s important to know that “training your brain” you can change your state of mind. First of all to have a growth mindset you have to start watching the world in a positive way, embracing new challenges, taking the judgement of the other like an advice, thinking that the effort is essential to always give your best. Secondly, it’s very important the way of how you deal with a failure. I really liked Luana’s comment about it. “The more we fail and the more success we get.” Sentences like this are very hard to believe. Especially the young people today are scared to fail, to wrong, to lose. But it’s even true that without a failure, you never know where and how you have to work to improve. So never give up and do everything possible to reach your achievements. I play volleyball in an agonistic way and I think that in particular for an athlete it’s necessary believe that mistakes are part of learning and improvement. Work hard and self-confidence are fundamental. Finally I want to thank you prof for this lesson. I found it very interesting and inspiring and it made me understand better to which “category” of mind I belong to the most. Remember that those categories are not FIXED but subject to change as we’ are all evolving, hopefully 😉 It’s a long JOURNEY. Like Ginevra and Iris wrote, I’m very grateful for this activity which really helped me to find again the motivation I’ve partially lost. There’s a quote I heard in one of the videos above which says “DON’T GIVE UP. THAT’S WHEN YOU NEED MORE EFFORT, NOT LESS”…. I think I’m gonna write it on the wall of my music room not to give up when I come across a hard challenge. Doing the quiz on mindset I had proof I’ve got growth mindset with fixed ideas. I’m pretty satisfied with this result, even though it would be better to be 100% growth. The most significant part of me, which makes me “fixed”, is the fear of making mistakes and look stupid. I love people giving me feedbacks, especially when I get wrong on something, but at the same time I would always want to do things perfectly. For example, I performed last week singing 4 songs; the first three ones were great, whereas in the last one I made a mistake in the chorus. Would you believe me if I told you I felt awful for the next 2 days? I’m very competitive and I feel upset when I don’t achieve what I set myself as goal. At school too, I feel gloomy when I see people having better results than mine, even if I’m pleased they did a good job. I do believe, especially in these occasions, that a growth mindset is fundamental because it makes you feel much much better with yourself and makes you avoid unhealthy comparisons. Being mentally fixed is counter-productive. Embracing opportunities and facing setbacks with effort is the only way to overcome them. Not doing that, it won’t let you going on and taking advantage of what life can give. I do believe we all have a growth mindset, hidden somewhere: everybody wants to improve, to achieve at least one goal in life, to realize, to live well… but society 99% of the time hampers people’s dreams, people’s mood to get in the game! That’s why we, even temporarily, fall into the condition of fixed mindset. That’s completely wrong… we need to react, we should take challenges and overcome them, even if it means to make a hudge effort! They say we live once, I believe we die once.. people have the opportunity to turn their life, and exactly there (in the moment we take position) begins a new one! Great topic to choose prof! Well done! Let me start from an other point . When I think about a growing mindset I ask myself: “ Do I want live in a more prosper world?”. In my opinion, this my question is not meaningless or not pertinent to the task one because if we are capable to find a second meaning in it, we will see that my question is directly connected to the first one. Mindset can make our world rise or fall down because, personally, I considered that if the earth is full of people that hold a growing mindset, I can’t find a problem in it but if there are none of them and so, full of fixed mindset people, I think that the world will not develop or improve. But in the other hand, I believe that, although exits the group of people that have a growth mindset, if they don’t agree to cooperate for the world evolvment it’s the same as having people with fixed mindset.So, my answer to the task question is the same as the answer to the question that I made on my mind, that is yes only if they make available themselves for a prosper future and a world full of features that can help people living in better world or feel at peace with themselves. Most of people does not think about it, but this reality should be faced by each of us. Thinking is our whole life. We think every single moment and our mindset influences our decisions and our actions in every single way. Being conscious of what kind of mind we have represents a major step towards improvement. Teenagers should be instructed at school to make the most of their potentiality and to develop a growth mindset (not a fixed one), which means to have a successful and happy life. Unfortunately is not easy to overcome all the difficulties and we are all misled to a wrong kind of life perception. Most of us is scared about what others think and this makes people be what they’re not. It’s always been one of the biggest problems of humanity. Another important question is: do school marks define people’s real intelligence? No, they don’t. Intelligence should be a sum of a lot of aspects, including maturity. Marks only define how much and how a student has studied a specific topic. The personality and the open-mindedness of a person could be two of the indices of intelligence. Having a growth mindset is also important for a good self-esteem, which is fundamental to have a good life. Never stop believing: if you think you could do it, you will, no matter what. Believe in yourselves, and you could be anything. Actually I do not agree on the idea “You can do ANYTHING”. No we cannot do anything, this is an EMPTY REASUURANCE..We must come to terms with our limits and accept them. INSTEAD WE CAN PROGRESS, step by steps. 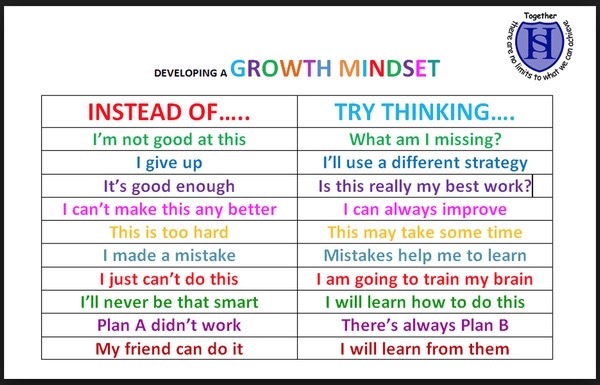 I used to have growth mindset, but since this year, I have more heavy activities and choices to make (Alternanza Scuola Lavoro, Orientamento, etc …), I think that I’m becoming more a fixed mindset. I think that mindsets are generated by the situations you live, and especially in these years, where the competition (and consequently the fear of failing) is getting stronger, the “fixed type” is utterly dominant. Although I find the contents interesting, I have to say that the videos lack of something really important. How to change from a fixed to a growth mindset? How to overcome the fear of failure and the laziness, and be available to take challenges? How not to take criticism personally? I think that fixed mindset is the “easy way” to approach things, but it is also more stressing. Growth mindset leads to success and happiness, but it takes hard work and effort. The best geniuses of human history had this last type of attitude, and in my opinion the world would be a better place, if suddenly more people changed their fixed mentality. Unfortunately I believe that you have to count on yourself to become “growth”, and a lot of people are not strong enough (discouraged by society and media). Yes, especially nowadays is very difficult to change just because we live in the middle of a “vertical society”. Instead of grudge and revenge we should promote cooperation and understanding because the “different” does not have to be seen as “strange” but as something to learn from and something that CAN absolutely open our minds. I really liked this activity because it gave us the opportunity to talk about a topic many times ignored. 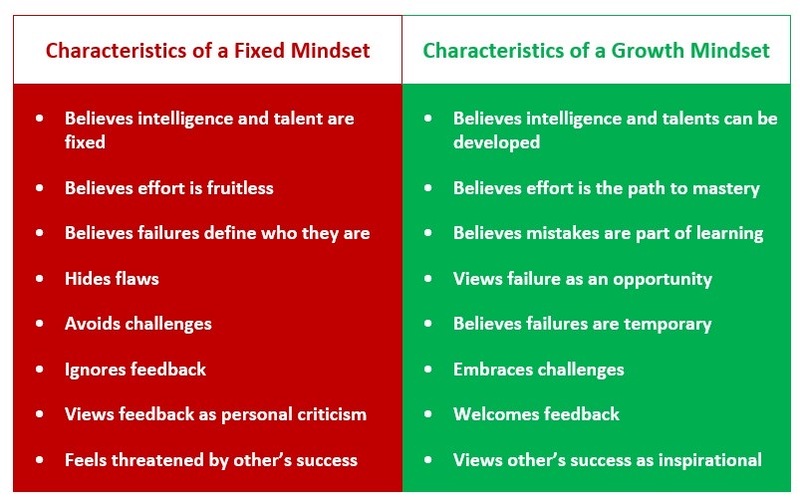 I believe and hope to recognize me a lot more with the growth mindset than the fixed. At the same time I believe that a person cannot have 100% growth mindset, because we are human, each with our weaknesses. Perhaps that awareness can open our eyes and also help us in the dark moments of tiredness, selfishness, superficiality to see the “half full glass” and not remain paralyzed by adopting a fixed mindset. Many times we are conditioned by the people around us and the society that forces us to be in some way, to get some results or worse to be perfect. But nobody is perfect. We must not believe people who tell us that we are what we are born, that intelligence is a fixed thing and that we cannot change. Because it’s not true: we can become what we want. A person achieves success if he becomes the person he wanted to become. This will not be easy. There will be many obstacles and many difficulties but the keyword is “don’t give up”. Personally, I think that almost everyone, who who aren’t going through a difficult period, would answer at this question saying that it would be worth taking on the new growing mindset. But in my opinion, when we find ourselves forced to face everyday-life problems, obviously it is 50 times more difficult to employ this positive attitude, just for the simple fact that it’s easier. It’s easier to blame others for your failures and do not take the matter in your own hands, and it’s easier to avoid challenges just ’cause always seen as something hurtful. However, it’s in this particular cases that we can realize or understand if we own a fixed or a growth mindset. But, at the same time, it’s also in this cases that we can improve our growth mindset (if we already have one), or we can start building up a new one, because (like a person with growth mindset thinks) it’s never to late: intelligence and talents can always be developed. In the last lesson we talked about a theme which made me think. The word MINDSET it make me think about another two words: MATURITY & FAILURE. This year this word (maturity) persecuted me, still today. People have given me immature, based on my behavior and not on my mentality, but I think a person’s maturity can not be seen only by the way they behave but also by their world of thinking, which is the most important feature that determines maturity. This is all about your MINDSETS. Said sincerely that word hurt me, and it influenced my way of thinking and a little bit my way of doing in everything. When we talked about mindset we refer to people those have successes in life, but not only them, but also those who have failure in life. In my opinion life would be boring without failure. If you do not want to fail that is in your hands and in your mindset, If you want to succeed in life you must first accept that you have failed, secondly, you need to find a way to solve this problem. Many can find it a simple thing, but it is not so, because failure leads to stress and the desire to give up on everything and not go ahead and slow down the times. Personally, this is me, and I know it’s not a good thing, every time I fail I demoralize and I feel very stressed and lock myself, and trying to behave normally. Life will be always full of difficulties, but the key is to NEVER GIVE UP. “ School’s achievements don’t define how intelligent you are”. In my opinion every person has a different type of intelligence and school only grow your mind, so that you can “enrich your cultural baggage”. I agree that know everyday new things is wonderful but on the other hand the way how we know new things is too quick, too complicated for nothing effortless and entertaining. We have to learn everything fast and in a huge quantity, with marks that show how good we are and how much we have understood about the subject. Students are set to be competitive, to be better than others, individually. I live everyday with anxiety, I’m tired and I feel like Giorgia , overreach of work, responsibility, stressed. I’m a grow up mind, I’m not a fixed mind but this system destroys me. Despite everything I’m here!!!!!!!! I’m strong!!!! As I said I’m a grow up mind, I welcome feedback (obviously it depends if feedback become something negative for my person, become something critical), I believe that failures are temporary because sometimes happens that you have a dejected day. I see failures as an opportunity to show others how I am strong and that nothing can bring me down. After all I work with all my possibilities but I reckon that my school system try to destroy grow up mind. I did my best, I do my best and I will do my best. I hope only that this year could finish better than other, because when you put your soul in the things you do, you want that your effort be recognized. Reading all my classmates opinions make me think that I’m not alone, that we’re all in the “same boat” and if our grow up mind work together we could show that we are more strong than ALTERNANZA SCUOLA LAVORO, philosophy and history “blitz”, sentence like “You will never do anything in your life” and other stuff like that. All the people can have a growth mindset. It’s not something that you have from the birth, it’s something that you develop and improve every time. But in my opinion, having a growth mindset is not always easy, for example if you think at the school system where the students most of the time are considered a NUMBER and where people think that if you’re good at school you will be someone, instead if you aren’t good you’ll be only a failure and nothing more. School should help us to develop our skills and should put us into a positive “competition”, that means cooperation, working hard TOGETHER. It’s not a mark that makes a person intelligent, but how can we stop thinking that being intelligent doesn’t mean going well at school if we live in a society where the most important thing is the RESULT and not all the EFFORTS happened before? We should appreciate more the efforts of a person, we should embrace challenges without the fear of being judged as a “stupid” or “unqualified” if we make a mistake, because mistakes are part of our life and are absolutely part of normality. Ok now read all the comments I left above. I need considered my students as numbers, nor did some of my colleagues. We teachers, “DON’T HAVE TO LOVE ALL OUR STUDENTS, BUT WE HAVE TO CARE ABOUT EVERY SINGLE one of you”. Focus on the things you have not only on the things you don’t. Personally, in this very moment of my life I feel I am balancing between these two extremes. On one hand, when I fail at something I am really unwilling to try to do it again (and actually there are very few times when I don’t give up), whereas some other times when I see people who are gifted or who achieve important results I tend to envy them and I wonder what is the difference between me and them. On the other hand, I think that qualities can be achieved with effort in the case they are not innate: this is the reason why I always try to do my best to learn new things and to increase my knowledge in various areas; I know this process is tough and full of up-and-downs, but I am aware as well that without effort nobody can do anything uselful for himself and for other people. You’re definitely right Carlo and your effort and commitment has already paid back! I’ve always associated the word “mindset” with how positive or negative a person’s attitude was, and I’ve always thought my mindset was, somehow, mostly on the negative side. Now I actually know that people can have a fixed mindset or a growth mindset, and I can reflect on my actual mindset. Knowing how both of the mindsets work, I dare to say that I have a growth mindset. I think that all people can have a growth mindset, during their lives. As Carlo said, every person moves constantly from a fixed to a growth mindset: it happened to me too, and I think that, maybe, in 5 years or more, my mindset will slightly change again. During my childhood I recall begin a kid that embraced challenges, that viewed failures as opportunities, that wasn’t afraid of making mistakes because they were part of the learning process, that received feedback and accepted it as it was, without taking it personally, not even once. In middle school my mindset definitely changed: I was afraid of making mistakes and tried to hide my failures, I felt sad if I received a bad feedback, I would have never wanted to commit to something if I wasn’t sure that I’d do great. This kind of mindset affected a lot of aspects in my life, made me feel insicure and made my life worse. Right now, I feel like I’m balancing between the fixed and the growth mindset : I’d like to say that I’m mastering the growth mindset, but it’s not like that, and I have still a lot of work to do, before having a full growth mindset. My parents teached me that I have to work hard to reach my goals, and try to never give up If I really want that thing. Keeping this in mind gives me the strength to go on even in days when the lazyness overcomes and I feel like giving up. In my opinion the society where we live and in particularly the Italian’s school system push us to focus only on the result and to give not importance to the growth. When somebody fail there is always someone ready to judge and deride him; sometimes i have the impression that a failure correspond to a victory of someone else that is happy about the bad results of the Others. For this reason I think that is not easy develop a growth mind in a school system where the students are identify on Numbers and where a lot of professor doesn’t mind about the efforts but only about the result. We are all person and we have different quality and ability, we have to improve ourself day by day and whit efforts and sacrifices we will find the road for our personal success. Sorry you feel like a “number” as you should have had the evidence, in these years, that some teachers really CARED ABOUT YOU. Did you care about them? Taking a bit of time to reflect on my mindset helps me a lot because, above all in this period, I’m very stressful and I don’t have the time and the will to reflect on myself. But, thanks to this activity, I can reorganize better my mind. First of all, I believe that, with the new growth mindset, we are improving our way of thinking and we are developing the ability to understand the others, and that’s amazing. But the problem is that sometimes people think for themselves and they have a sense of superiority among others: they usually do things only if they gain something without putting effort and finding the easiest way to obtain a good result; they criticize other people but at the same time they are always jealous of them and finally they want to reach the perfection and be at the centre of attention. In conclusion, I’d like to say that it doesn’t matter how many times we fail and we mustn’t be worried about others’ judgement, but we have to improve and try, try and try again until we can reach our goals because, like Albert Einstein said, “anyone has never made a mistake has never tried anything new”. So, we have to understand our mistakes and then overcome them, not giving up at the first occasion, because it is only making mistakes that we can learn something that we never tried. In fact I believe that there’s nothing more beautiful than learning new things, even learning from the others, and we have to be aware of our capacities and try to catch all the things we can, the good and the bad ones. You replied to yourself already:” it’s very difficult to have a growth mindset because sometimes I don’t want to put a lot of effort on what I do and this makes me a bit disappointed because I know that I can do more than what I’m doing now, but maybe I don’t have the will to do it”. I’ve liked a lot this activity, I think it is probably the best we have done (talking about the ones that don’t concern literature) ’cause it makes us think about our attitudes and our ways of acting. I think that we all have a different mindset, like Luna said, so we react in different manners following our values and ideals. Watching what’s going on now a days I have the perception that young people would like to have all they want without any effort. That’s bad because we need to fight to realize our dreams. I’ve started my swim career when I was little and when I was 8 I’ve started participating in competitions so I grew up with a sport mentality which makes me think always to do my best and support my team mates (I do it during every race, I’m the screamer of the team 😉 ). But sometimes is difficult to be confident and smile and believe in you when your crono or your race didn’t went well enough. Is in those moments that you should think “positive” and learn from your mistakes but sometimes is harder than you think, especially when you have worked a lot to reach that goal and finally you don’t reach it. Fortunately my team and my trainer know always what to tell me to make me believe in myself again. Reasearching some material for my tesina I found a quotation from Jesse Owens that says: “we all have dreams. In order to make dreams come into reality, it takes an awful lot of determination, dedication, self-discipline and effort”. Personally I got inspired from him and his strength and belief. I wanted to share this sentence because we need to think that we can improve our abilities in all fields of life and because it makes us aware of the fact that without determination, dedication, self-discipline and effort we can’t do it. I LOVE that quotation and agree with what you said. As other inspiring comments said, grades do not value who you are. You are defined by the effort you put in what you do and love, by your passions and attitude, not by the results. Albert Einstein once said: “Everybody is a genius. But if you judge a fish by its ability to climb a tree, it will live its whole life believing that it is stupid”. I strongly believe this may summarise our current educational system. We end up assuming that, if we didn’t pass a certain test (not to mention physical education tests……. ), we are a failure and below expectations. The truth is that we all have different timings and capacities but we are often taught to conform to certain standards. I think that this attitude may lead to a sort of resignation because you don’t find an aim anymore and may feel like you are not good enough to succeed. I believe that everyone here has the intelligence capacities to make it but we don’t always put the necessary effort while we study or do activities, for several and personal reasons. Although we all know that education plays a decisive role in our development, there are also teachers who don’t encourage students at all. In my opinion, there is no point in yelling in front of a whole class that they will never do anything after this school year and then think that this may lead to a positive approach to the school itself because it won’t. Definitely. Everyone should individually change his or her mindset and the way they look at failure and success and finally, some teachers should become aware that they are educators, not spirits destroyers. Apart from the educational field, this topic really made me think about how I tend to approach to difficulties and I hope I will soon become much more aware of my capacities. LOL “spirit destroyers” it’s awful! When I first saw the TedTalk by Carol Dweck I was very interested in the theory of the fixed and growth mindset and because of this reason I was so glad to present this speech to my classmates. I think that this speech may concern all of our lives. I’m a person with a very fixed mindset perspective and not only in the field of school but also in everyday life and that’s probably because of my personality. I give up very often and if I didn’t have people who encourage me, I probably wouldn’t do all the things that I am eventually able to do. That speech enspired me a lot and I think that everytime from now on I will think about the power of yet and I want to believe that I can do everything if I put efforts and I continue to persist and believe in my capacities. Everyday I bump into a lot of problems and everytime the only thing I want to do is cry because I’m so fragile but I think that crying is not bad because then I feel better and I’m ready to fight with all my strength to deal with my problems. Especially in this year I realize how important and precious is my life and I understand that I can’t throw it away because there are so many beautiful aspects in it and I can’t forget them because they overtake the bad moments. If I had to think it’d be worth assuming, taking on the new growing mindset? Yes, Yes, Yes! It’s not simple because there are always issues that tend to make you sad but I can always try to improve myself. What I want to say is that no matter how hard is life, the only thing that count is to never give up because I understand that I’m not alone and around me there are a lot of extraordinary people who will never leave me and always love me and believe in me. This is what encourage me to face my problems and this is what help me to grow up and to have a more growth mindset. Finally, the only thing that I want to say is thanks to all the people that put obstacles in my life because without them I wouldn’t change and mature. “You have to work hardest for the things you love most. But isn’t potential someone’s capacity to develop their skills with effort over time? And that’s just the point. How can we know where effort and time will take someone? Even in the growth mindset, failure can be a painful experience. But it doesn’t define you. It’s a problem to be faced, dealt with, and learned from.” ” I hope it’ll take you where you’ll feel content and satisfied. I can’t Identify with any of the two – even though the tests resulted both quite in the growth mindset sphere, but not completely. I’m not sure I agree with this dualistic vision of the human mindset, but sure it is a way of measuring our grade of open-mindedness and respect for the others. I couldn’t help but try to set my mind to the definition of growth/fixed mindset and that was impossible! Not because I’m special but because I have a fickle mind – and so do many other people. The ones who know me can agree that I am open and friendly most of the time. I should define my mindset as growth since I am a good friend with the ones who deserve it and I’m not afraid of other people outdoing me. But when I am nervous or disappointed I feel the anger, the anxiety and the will of violence and I can’t push then away, I push the others away instead because I don’t want them to think I’m a bad person or that I can hurt them. This is pretty much a feature of a fixed mindset, if we choose to speak with these terms. This is why I came to the conclusion that people can’t be put into categories according to their reactions, that is merely a way of convincing people that they can do better. Not that it is a bad thing to do though. It is a good start. I’m not guilty for being impulsive… that is something I don’t want to change, because people know me for features like this and I feel like I would become empty and ordinary if I force myself into a category that defines my way of thinking. 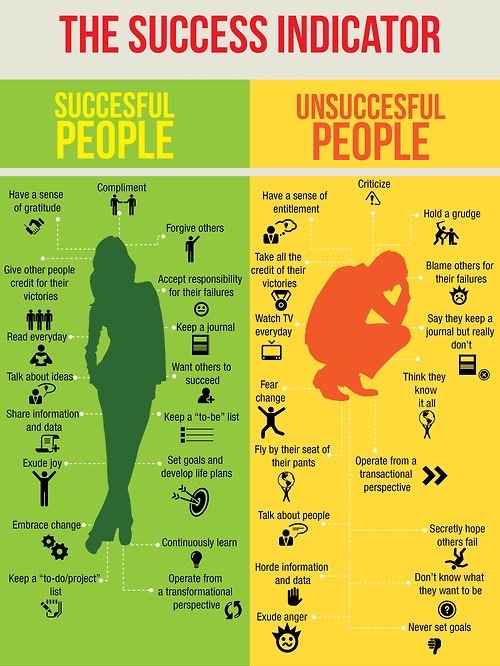 Successful people, unsuccessful people, fixed mindset, growth mindset etc… Personally I don’t like this kind of grouping because I think that everyone have at least a good quality and maybe this isn’t linked to the words/descriptions that are here represented. This can demoralize a person instead of encouraging him/her. Upbringing plays an important role in our life, it can let the others appreciate what you are good at because the way of presenting yourself and the good manners are always helpful to relate with others. To me the description of a person with a growth mindset is a paradox, nothing can afflict her, she has all the quality that everyone desire, but actually this model doesn’t exist. For example I think that everyone feels disappointed or angry after a failure but it doesn’t meant that will be unsuccessful. In my opinion a “growth mindset” is a prototype to follow to improve and succeed but it is difficult to fulfill completely. I don’t want to look pessimistic, I believe in progress and I think that our mind can change in better every day, but there are characteristics that belong to our nature that can’t be changed. Sorry but you should watch the videos and read more carefully what we have done because you have totally misunderstood the main ideas of Growth Mindset. It has nothing to do with having good qualities, actually the opposite. Read better and open your mind please. 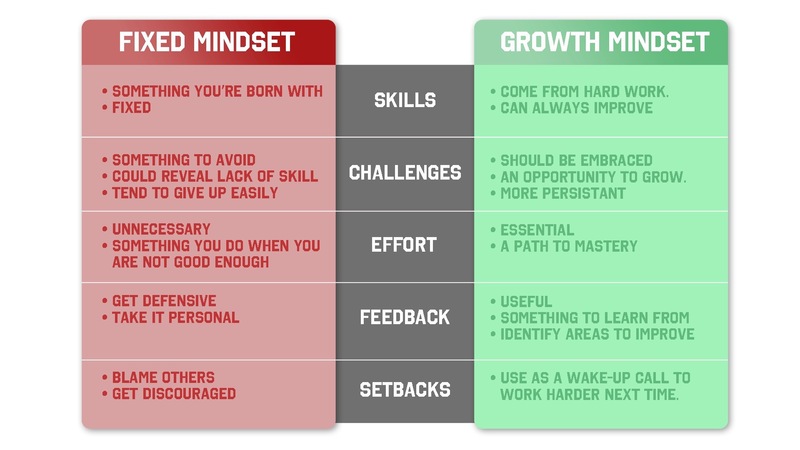 I think it’s impossible to categorize each person only in the fixed or in the growth mindset, we all pass through this two types of mentality. Personally, I don’t think the problem is to be able or not in reaching a particular goal, the real problem is the time that you would have to spend to reach that goal. I know that I’m not perfect in organize my time, ‘cause I’m not able to keep concentrated for so much time and very often when I have to do my homework it’s very much easier to think about other things. Since the beginning of the year I’ve been improving it, trying not to waste time, but it’s very hard for me, mostly because I don’t always agree with what some teachers do, how they do it, how they organize or not the time we spend in class and the homework that they assign. Of course, I’ve made some progresses, and I still want to improve it but, knowing myself, I don’t think I can make a miracle the last month of the year. In general, I think at school it’s very difficult to have a growth mindset, for different reasons. First of all, it happened very often that you have a teacher who give you the same mark although you try to improve your way to study. If you think that you are studying better but always receive the same result, It easy to think that with that teacher you can’t do better, and so you just do your best thinking that you are born with some skills and without others. Furthermore, in the school you are inevitably compared with the others. And most of the time it’s difficult to see the other’s success as an inspiration, above all when you study a lot and obtain less than another person who have studied less time. What we need to understand is that we are all different, with our skills but also with our failures and our flaws. Simply we need to believe that these failures are part of the progress and they show us what we have to improve. I agree with you and I think sometimes we let our school life too much into our lives. I prefer to keep it detatched from my thoughts and feelings, even if the exam is very close! 1) If you are studying better but always receive the same result it means you haven’t CHANGED STRATEGY and therefore there’s no change. 2) “When you study a lot and obtain less than another person who have/ HAS studied less time it’s because we have to admit that there are people who have better skills than we do (memory, speed, you name it!) but anyway, in the long run, it’s the person who commits and makes more effort that will improve and be successful. Her I’m afraid I think you should change mentality. “Do people with this mindset believe that anyone can be anything, that anyone with proper motivation or education can become Einstein or Beethoven? No, but they believe that a person’s true potential is unknown (and unknowable); that it’s impossible to foresee what can be accomplished with years of passion, toil, and training. 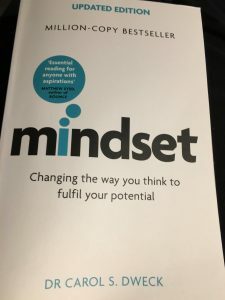 I agree with Elisabetta on saying that nobody can really embody all the characteristics typical of growing mindset, because, for example, a person can be very ambitious, and therefore wants to be the best and secretly hopes for others fails. Even because we are always been learned that the competition, outside, is very high and you have to fight to reach goals and find a way to overcome others, if you really want to succeed. That’s why I don’t believe it is possible to identify a person completely as growth o fixed mindset; despite that, it is undeniable that assuming a growth mindset is more worthwhile for everyone and try to improve our mindset is something that we should always do. Of course change our approach to the world and other things in general is arduous and you can’t just imitate or act like a growth mindset but truly grow up mentally, that is a long process. I think you have some misconceptions on Growth Mindset. Read other comments & watch videos better. I believe that there aren’t insurmountable boundaries between fixed and growth mindset and everyone should try to develop a growth mindset, even if it is not always easy. I always had the idea that everyone can achieve great goals with hard work. Talent is not always a gift or something that you born with, in most of the cases is something that you develop through effort, failures and patience in fact most of the things in the world need time to be done in a correct and “perfect” way. I developed a growth minded especially in the latest year; during my life I wanted to give up a lot of times sports and others activities because I thought that those activities were too difficult and also because the others told me “This is not the right thing for you!”. I think that during our lives we could try to do everything, there isn’t something “wrong” or “right” for us, there could be only something more difficult or easier, something that take us more time, or something that we need to work harder on. I’m grateful to who develops more a growth mindset because this kind of person helps me a lot to be positive and believe in myself; they teach me that I can always improve. Like some students said in the previous comments: at school we need people with a growth mindset especially teachers because they can help students to develop this type of mindset. Finally I would let a positive comment, which refers to this kind of lesson: I really appreciate it because it makes me clear in a visual way the different between fixed and growth mindset and how they can impact my behavior and my entire life. I try to develop more a growth mindset, I think that my next step will be to welcome feedbacks! I’m glad you have found this activity inspirational and found your comment honest, sincere and interesting. I found this activity very interesting, but I know people can behave in certain ways in different circumstances, so they cannot belong to either the fixed mindset or the growth one. As for me I know I do not behave all the time according to one of this categories. Of course when I was younger I had problems in trusting my skills. I used to think people were better then me, and tended to compare myself with them. Feeling this way obviously did not help me grow. Today I alternate days where I trust my instincts and knowledges, I listen to critics, and study not because I “have to”, but because I “like to”, and other days in which I still feel inadequate. Some days I feel as I can rule the world, and others as the world is smashing me. I always set goals for myself, and it does not really matter if they change often. I love changes, but fear them at the same time. What would Doctor Carol S. Dwerk say about that? Would he create a third category?, Or probably I still have to find out who I really am. I found Francesca Zamparini’s comment really interesting, especially in the part were she said: “everyone has a little side of themselves where they hide grudge and selfishness but life is one and is long and all we have to do is deal with it and make ourselves always better persons in it”. I really love this quote because I think that what makes a person complete isn’t becoming the best in the world, the best in everything, but doing the best in his or her possibilities. I think that effort is something to learn from, is the stepping stone for becaming what you want. I found this video in youtube: https://www.youtube.com/watch?v=UF8uR6Z6KLc. It is a speach of Steve Job’s, that I found very interesting and ispiring. Especially in the first part, it made me understand that, he wasn’t perfect, he have never graduated, but in the end, with his grouth mindset, he became what he wanted and he overcame oll obstacles. I honestly found this activity inspiring since it brought me so many ideas on my future as an university student and my overall attitude towards life. Nevertheless, I do not totally agree with the huge difference that was brought up between the two mindsets, one being 100% positive and the other the exact opposite; and I’m not only referring to the evident chances of being in between them, since they are both so extreme, but especially to the freedom of choice they are strongly based on: what I mean is that it always looked like all choices from both sides were taken freely and as a result of the single person involved, and nothing more; on the contrary, I think that there is a big shadow over the freedom of action for many people, and that’s the social environment they live in. Modern society implies some differences in culture, gender, background and economic condition that influence us with almost no escape, because they are deeply built in the “common thought” of a certain type of society; and most of the aspects i just mentioned are more directed towards the fixed mindset rather than the other one. As for me I already said that it cheered me up a lot and made me more positive towards my plans for the future, hoping that I will be able to apply at least one of the many aspects described all around the videos and pictures. I mainly have a fixed mindset, although I agree that the differences mentioned between the two types diverge way too much, as someone already said. Having a growth mindset must be definitely helpful in life, so I think that developing one is very important. Personally just the fact that the way of thinking could be changed was a discovery itself (I guess here we can see that I have a fixed mindset) and put me in a positive perspective. I was particularly involved in Carol Dweck’s speech and I firmly believe it’s essential that maturing a growth mindset should start from the school system, since school has a huge impact on us and on our way of thinking; therefore I consider the role of the teachers extremely influencial and I strongly believe in the power of words and in the impact that they can have on people. You have no idea how glad I am at what you’ve just said Ambra. Surely now I’m a person with a growth mindset, but I spent the others 15 years of my life feeling unconfident in every aspect… During the last year I improved myself and I changed my mind (thanks to an important person); I said myself that I couldn’t carry on my life in a pessimistic and negative way. I thought that with my fixed mindset I couldn’t climb to the top and realise my goals. If you are a fixed person you waste a lot of possibilities that your life could offers, even if maybe they’re hidden, but a fixed person don’t look for them because she has a sort of winker that permits to see only misfortune; you are destined to collapse. Yes, I have some behaviours of a fixed mindset too, but I’m changing them. For example sometimes I feel threatened by other’s success; I’m afraid of being the worst, but I’m learning to make of this a point of start. Unfortunately with people that brag their success or qualities and think that they’re perfect I tend to be very strict and I tend to change their mind about their illusory perfection and obviously, often I receive failures; for me it’s very difficult giving up in something and when I receive a failure from a person I don’t quit the challenge to succeed in it. I never give up in anything and sometimes it’s a waste of time because a lot of people don’t deserve my time. A lot of people could acquire that nobody is perfect when is alone and that they could contain their hubris to help someone. Effort is one of the things that improves ourselves to arrive at our purpose, happiness. What an honest and sincere comment Martina! Your resilience – as I told you from day 1- will pay back! Although we’d like to always have a growth mindset, the reality is that most of us think in a fixed way. The goal is to recognize fixed mindset elements in ourselves and work on them. Last Monday lesson was useful to reflect on the differencies between the two types of mindsets and after that I tried to think about some attitudes of the people I’m in contact with. Of course, it’s surely easier to analyse the behavior of the other people, and for this reason I feel I can’t exclude myself when talking about habits that should change. Analysing, for example our daily life, it’s not strange to find something that regards a fixed way of thinking: blaming the others for our failures happens everyday at school. This is something that must change immediately: we should accept our responsabilities and find strategies as a consequence. In my opinion, the key for an improvement in our daily relationships is COMMUNICATION. We should learn to talk about our problems and don’t be afraid of showing difficulties: teamworking is a very important aspect, that helps growing together, trusting the others and learning how to give support. Thank you Sara as you tried to FIX the main problem which in fact, most of the times is , wrong or non existent communication. “It’s no wonder that many adolescents mobilize their resources, not for learning, but to protect their egos. “When people hold on to a fixed mindset, it’s often for a reason. At some point in their lives it served a good purpose for them. It told them who they were or who they wanted to be (a smart, talented child) and it told them how to be that (perform well). In this way, it provided a formula for self-esteem and a path to love and respect from others.